Gordon Point Estates�An exclusive 26-acre seaside haven of exceptional properties, including 12 stunning acres of dedicated marine parkland. A model of exemplary development practices, homes are carefully designed and sited, while the natural features of each property are protected. These measures ensure architectural balance, environmental sensitivity, and the creation of a neighbourhood of fine homes with enduring value. Set on a lush landscaped lot across the street from a beautiful secluded beach, this gracious home offers an idyllic West Coast lifestyle. Serene water views sweep across Haro Strait, while nearby walking paths link the majestic trees of the forest preserve with the wild seaside bluffs and breathtaking ocean vistas of Kwatsech Marine Park. Positioned on the corner lot of a quiet cul-du-sac, this distinguished executive residence offers 3,358 sq.ft. of light filled quality. With an appealing floor plan of open yet intimate rooms, refined interior spaces feature solid birch and slate flooring, large windows, three fireplaces, premium finishing, and artistic custom detailing. Soaring vaulted ceilings supported by thick wooden beams create an ambiance of casual grandeur in the impressive family room. A fully vaulted upper level offers two bedrooms and a large office (or 4th bedroom) with French doors to a sunny South facing deck. Affording ease of access, the main floor master bedroom features a romantic gas fireplace, custom maple built-in cabinetry, walk in closet and an elegant ensuite with soaker tub and separate shower. French doors open onto a lovely private garden patio and rockery. On a masterfully landscaped 0.28 acre lot, with a fully fenced back yard, gorgeous exterior spaces have been created with mixed slate and aggregate multileveled patios, rock walls, slate staircases, a contemporary screened gazebo and extensive mature plantings. Unique custom detailing features ironwork by Crescent Moon Forge and copper work by Canmore artist Tony Bloom. Constructed with durable yet natural materials such as quarried Brohmstone from Whistler, aluminum clad Douglas Fir Loewan windows, Douglas Fir doors, sills and trims, slate, solid wood, and granite, along with Hardy Plank siding, much of this fine home is virtually maintenance � free. Convenient extras include: heat pump, air conditioning, in-floor heated bathrooms, wine room, in-ground sprinklers, and double garage. The years of careful planning that created Gordon Point Estates is evident in all aspects of this superior development, including attention to fine finishing details. Dogwood trees frame the driveway leading to the elegant rock and wrought iron entrance gates, while turn-of-the-century style street lamps, curved roadways and cobblestone parking strips provide old world charm. Recognized as a first class neighbourhood, rigorous building guidelines have ensured uniformity and quality throughout, protecting the value of this special home today and for years to come. 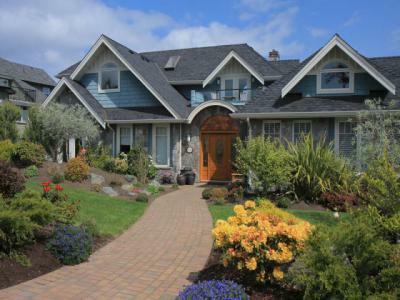 Only 15 minutes from downtown Victoria, this is oceanside living at its best.